ID RINGS closed rings are specifically manufactured for captive bred birds of prey. Made from alluminium, block engraved and colour filled, each ring is manufactured to the very highest standards and approved by DEFRA. All closed rings are supplied in strings of 10 rings. All of our rings have a unique identity number for your bird. Our rings are not year marked. WHATS IN THE PACKAGE? : Your order includes a string of 10 closed rings with unique ID numbers for your birds, including 10 certificates for OPTIONAL Ring registration. There is no need to send anything back to us by post. You can purchase your rings below. 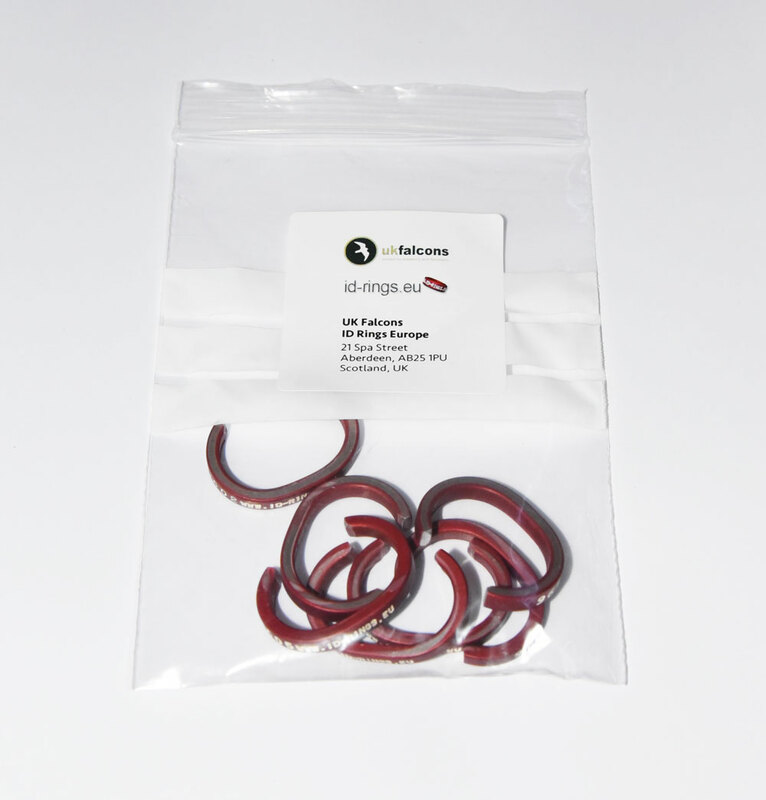 ID RINGS split rings are specifically manufactured for captive bred birds of prey. 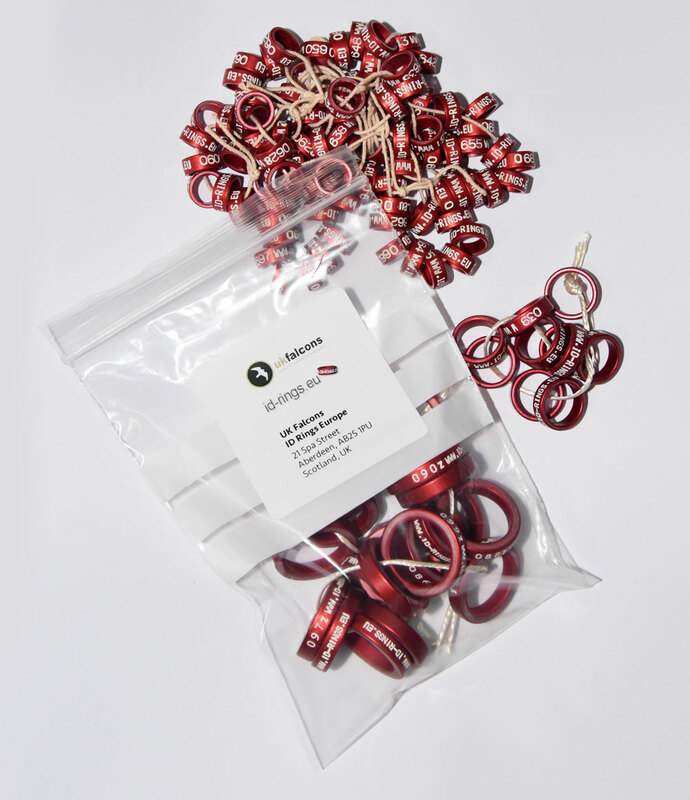 Our spilt rings are made for "unrung birds, closed rung birds or mature birds that do not have an ID Ring Identification System or ID Ring in place". The ring automatically works as a "return-if-lost" mechanism when registered with us. When you purchase a split ring from Identity Rings Europe, it automatically includes FULL Certified Registration on our Data Base. It is advisable to have an ID registered split ring on any bird of prey that is hunting free or flying free in a commercial activity, it will make the loss of your bird that much easier to recover. Made from alluminium, block engraved and colour filled, each ring is manufactured to the very highest standards and approved by DEFRA. Each ring is supplied OPEN, and is simply closed on the birds leg. PACKAGE: ID Split Ring: your order includes 1 x split ring with unique number for your bird, 1 x ID Bird-Ring Registered Certificate and full database ID Registration. Your registration details are held in strict confidence on our secure database. You can purchase your rings below.